An clár iomláine desna haltanna in eagrán na míosa seo. Seo mí dheiridh na Fichiú hAoise. Tosóidh an Aois Úr Lá Coille 2001. 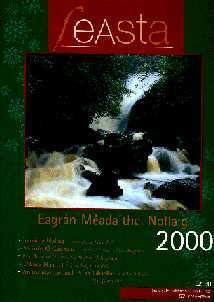 Is maith is feasach mé gur dúradh anuraidh gurb í an bhliain 1999 bliain deiridh na hAoise. Ní raibh sin fíor, ach is cosúil gur fheil sé do lucht gnó agus do dhreamanna eile, cé nach eol dom tuige. Ar aon nós, seo an t-am sílim le súil a chaitheamh siar ar pholaitíocht na tíre seo ó 1901 go dtí lá an lae inniu. B'é an Fichiú hAois an céad bliain is fearr agus is bisiúla dá raibh ag an tír seo in ainneoin na n-uafás a tharla. B'í an imirce mhór a mhair os cionn ceithre scór bliain an t-uafás ba mheasa díobh san go léir. Agus is ar éigean a tugadh sin faoi deara. Thuig teaghlaigh a raibh ag tarlú. Tuigeadh an briseadh croí a bhain le himirce. Ach níor chuid de chlár oibre na tíre nó an stáit é deireadh a chur leis. Níor tuigeadh go bhféadfaí sin a dhéanamh go deo. Caroline, an rúnaí, is túisce a shonraigh iad. Ceithre, cúig, leathdosaen beacha dubha ag siúl timpeall gloine dúbalta na fuinneoige ba ghaire di. Ba bheag di ceann nó dhó ach dob ait léi an oiread sin díobh a fheiscint. Ní raibh ann ach sin. I gceann leathuaire, áfach, agus an lá ag dul chun brothaill, bhí leathchéad díobh ann, iad á dtuargaint féin go dordánach i gcoinne cruas na fuinneoige nó ag eitilt ó chúinne go cúinne go carsánach ag lorg bearna nó boige san ábhar meabhail a mheall le háilleacht na huaine brothallaí lasmuigh iad, is a cheill go cruálach í lena chruas criostail. Chuireadar buile beag óna suaimhneas í; ba dheacair díriú ar an obair agus an seomra beo le buile a ndordán agus le heagla a ndealg. Ní raibh sé nádúrtha, níor mhiste é a lua Ruairí. D¹éirigh sí, chuaigh timpeall chun an dorais agus trasna leacracha cruaidh éibhir an halla mhóir tosaigh. Dhún sí an doras go haireach ina diaidh, á gcoimeád teanntaithe ina hoifig féin iad, i dtreo is nach gcuirfidis isteach ar aon chliaint a thiocfadh isteach sa bhfoigneamh agus a dhein ar oifig Ruairí Forrestal. 1. Breandán Ó hEithir ­ Iomramh Aonair. 2. Fearann Pinn, Filíocht 1900 - 1999. 4. De Bhunadh Protastúnach - Rian Chonradh na Gaeilge.